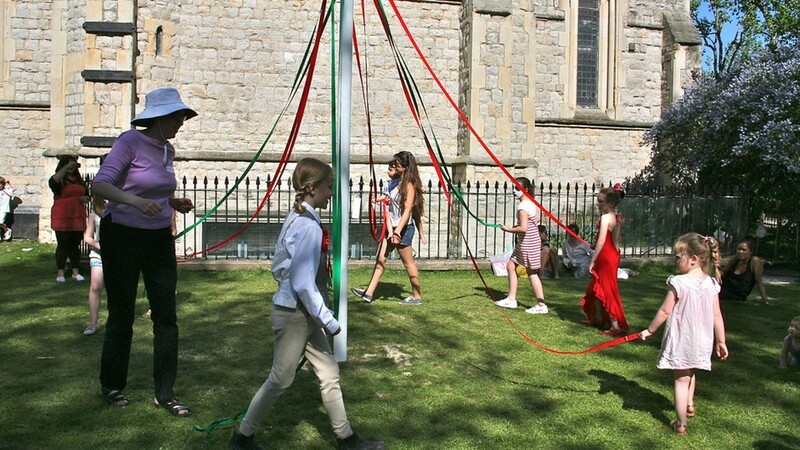 Part of the month-long Notting Hill MayFest, the Notting Hill May Fair is a traditional village fair in the heart of this well-to-do west London neighbourhood which has been running for more than 25 years. It's a real family event with local school children maypole dancing, traditional games and stalls, a fancy dress competition with prizes for the most creative home made costume, and a dog show. Bring along your poodle or pug or watch the show a drink from the Pimms stall. Additional entertainment comes in the form of music, a vintage coconut shy, face painting, a bouncy castle, and bric-a-brac, vintage jewellery, and second hand book stalls. There's also a children's area selling toys, books and good as new clothes, food stalls, cream teas downstairs in the crypt of neighbourhood which has been running for more than 25 years. It's a real family event with local school children maypole dancing, traditional games and stalls, a fancy dress competition with prizes for the most creative home made costume, and a dog show. Bring along your poodle or pug or watch the show a drink from the Pimms stall. Additional entertainment comes in the form of music, a vintage coconut shy, face painting, a bouncy castle, and bric-a-brac, vintage jewellery, and second hand book stalls. There's also a children's area selling toys, books and good as new clothes, food stalls, cream teas downstairs in the crypt of jewellery, and second hand book stalls. There's also a children's area selling toys, books and good as new clothes, food stalls, cream teas downstairs in the crypt of St John's Church, and a plant stall selling flowers from Covent Garden. What are the best dining options near Notting Hill May Fair London? Notting Hill May Fair gyms, sporting activities, health & beauty and fitness. The best pubs near London Notting Hill May Fair. Notting Hill May Fair clubs, bars, cabaret nights, casinos and interesting nightlife. Where to have your meeting, conference, exhibition, private dining or training course near Notting Hill May Fair. From cheap budget accommodation to luxury 5 star suites see our discounts for St John's Church Notting Hill hotels, including Hilton London Kensington Hotel from 87% off.